As if the crew on board the 10m Scorpion RIB Grey Ghost don’t have enough to think about during their 2,500-mile trip from London to Monte Carlo, we managed to convince them to send us pictures and updates along the way. We’re not promising much – they have greater concerns than emailing Motor Boat & Yachting after every leg, like consuming copious amounts of cold lager – but what they do send in will end up here. So far, helmsman Paul Glenister has sent us a handful of pictures from the opening weekend, where the teams went from St.Katharine Docks to Lorient, France via Jersey. As I type, they are bashing their way towards Arcachon, right through the teeth of the Bay of Biscay. Remember you can follow the boats’ progress on the Venture Track website. 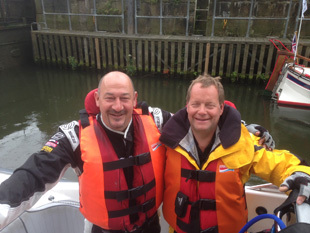 Pictures below: Paul Glenister and Neil Holmes of Grey Ghost look relieved after the first leg. 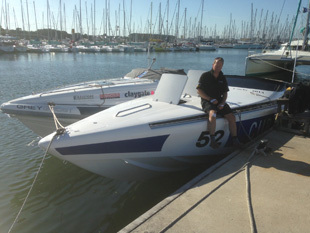 Paul takes a seat on Cube52 after the fleet ties up in Lorient. We will be posting updates from the crew as and when they arrive, so keep checking back.